Resurrected back in 2017, Sony’s robotic dog Aibo made a big splash at CES 2018, but there wasn’t much fanfare for the pup at Sony’s CES booth this year. A few weeks later, however, Sony has announced a new version of the robotic companion featuring a beagle-inspired tri-colour paint job, and some new tricks that expand the pricey toy’s capabilities. I sure hope that’s chocolate. As adorable robots go, Aibo (and especially the new Aibo Chocolate Edition) don’t disappoint, mimicking the stilted movements of a tiny puppy that hasn’t quite mastered walking yet, and doling out plenty of artificial affection to owners they’re actually able to recognise through onboard cameras. Aibo’s easy to engage with, but as we discovered after spending a bit of quality time with the robot, when that charm eventually wears off, Aibo doesn’t do much to justify its $1,800 price tag in Japan, or its $2,900 sticker-shock here in North America. As the robotics industry discovered last year, cute can only carry an expensive robot so far. To Sony’s credit, today’s Aibo update is not just a colourways facelift. In Japan, which has always been the most popular market for the robot pup, Engadget Japan reports that Sony is also teaming up with a security company called Secom in June to offer a ¥1,480 (or about £10) a month Aibo patrol security plan that promises to turn the robotic dog into a genuine guard dog – almost. Using its facial recognition and room-mapping capabilities, Aibo will be able to patrol homes and locate various family members, providing reports on where everyone is, and helping owners track down specific people, according to Sony. In its current form, these new features sound like more fun party tricks than a genuinely useful security feature, which is a concern we’ve had with other home robots. 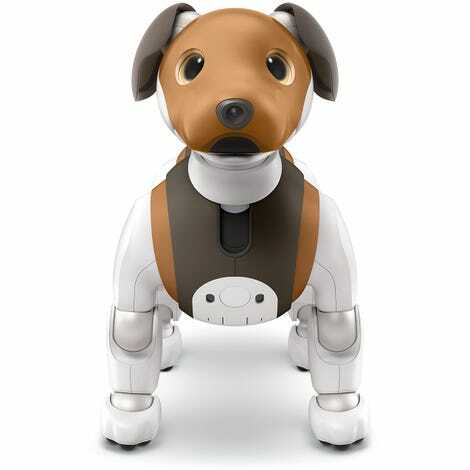 But Sony promises more security-focused features in future Aibo software updates, so eventually the robot might actually be a useful way to monitor your home while you’re away.